Odds are that you have heard of the Konmarie Method by now. 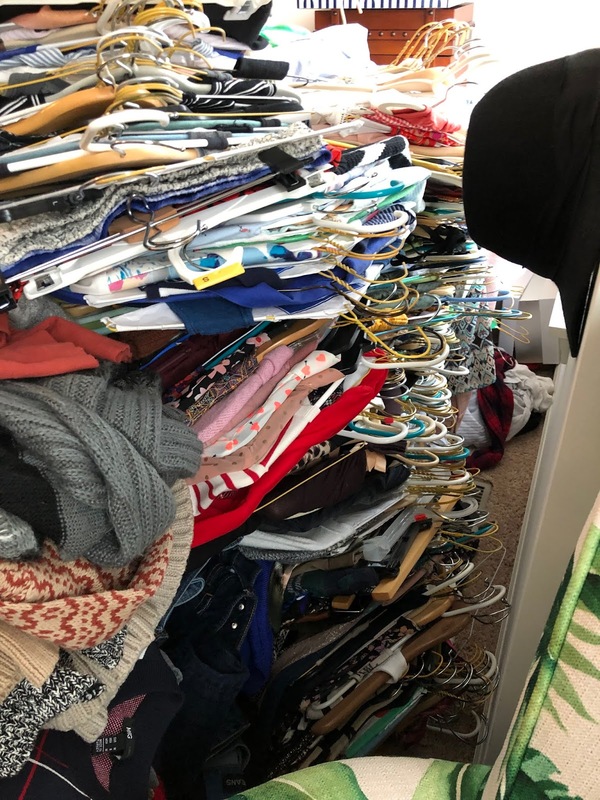 Thanks to the new show "Tiding Up" on Netflix, Marie Kondo has a platform beyond her book (The Life-Changing Magic of Tiding Up: The Japanese Art of Decluttering and Organizing), to help people organize their homes. Most importantly, her method highlights the importance of keeping only the items in your home that spark joy. As soon as I started watching the first episode on Netflix, I knew this was something I wanted to do. 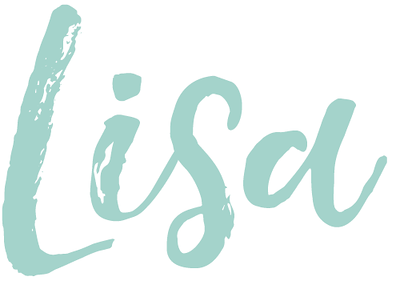 I had an upcoming social media break and thought it would be the perfect time to take on this 30-60 day project (with most of the "heavy lifting" in the first few weeks). I looked around my house and all I saw was clutter. Clutter from the holiday, clutter from recently adopting two kittens, clutter from day- to-day life. I walked into the room that use to be our office, and couldn't even walk in. Before Christmas this room became our catch-all room, and it was becoming clear that it was high time to go full "beast mode" on our home. When you use the Konmarie Method, there are five stages to follow. I will show you all five steps on the blog in the coming week, but you can also follow my progress on my IG Highlights section. 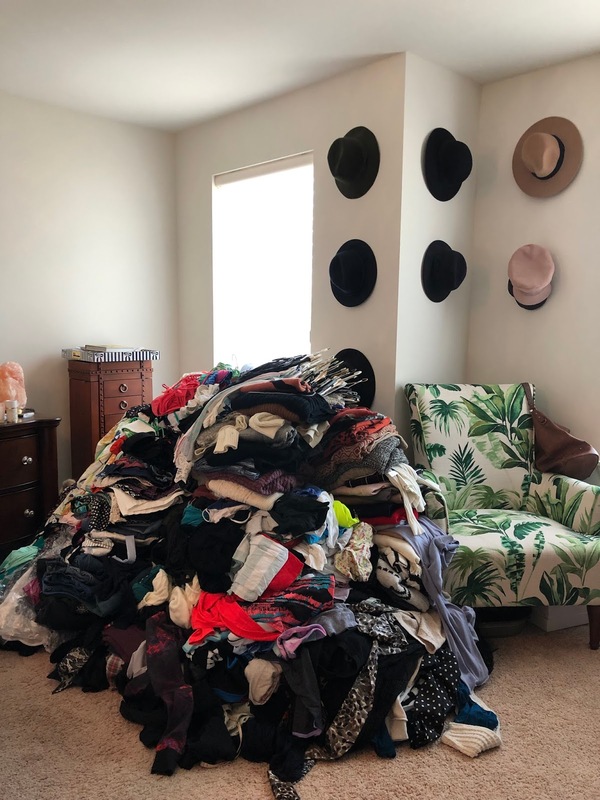 Stage one is clothing, and before you can decide what you wish to keep and discard, you must put everything in one pile. Everything! 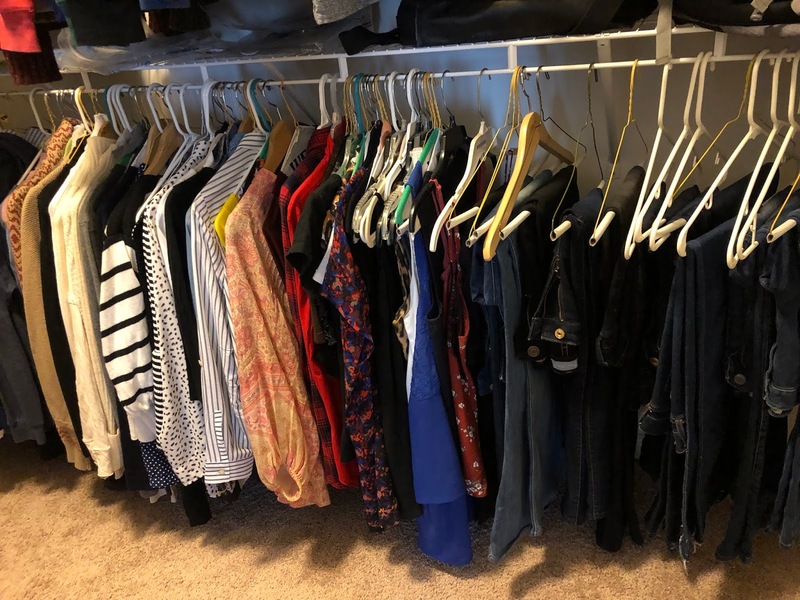 Empty your closet(s), drawers, I'm talking literally ever item of clothing you have. I went from room to room and did just that. 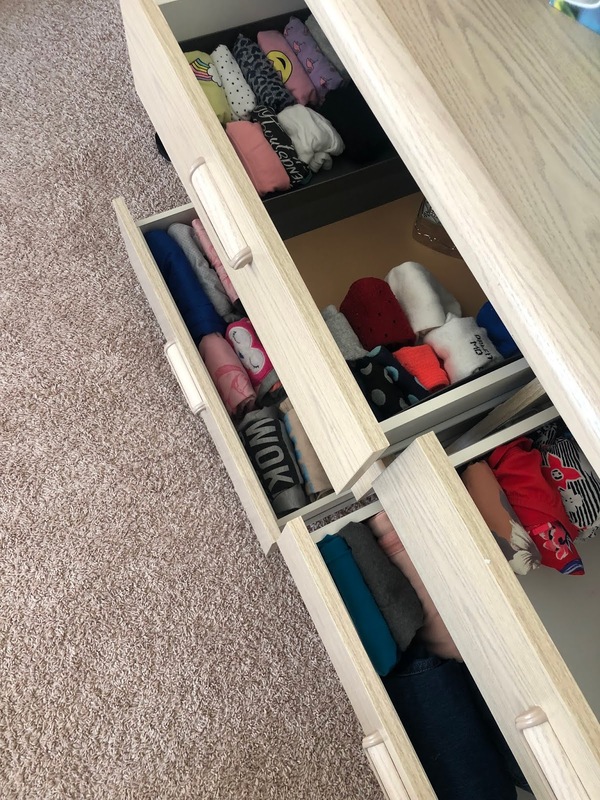 I decided to start with my kid's rooms and have each of them help me go though and fold all of their item. After you see everything in a pile, we took a moment to reflect on what we saw and how much we have accumulated. Next we created two piles, one for keep and the other to be discarded. For all of the items that we planned to get rid of, we have to thank them first. I know, I know, it seems a little silly, but it is important. When it came to old favorite tees or a hat that reminded my son of fun memory or moment, thanking the item made it easier to let it go. To acknowledge how much we used or loved that item, but it was time to let it go, was part of this process. After the Goodwill items were bagged up, it was time to start folding and finding spaces for the keep pile. 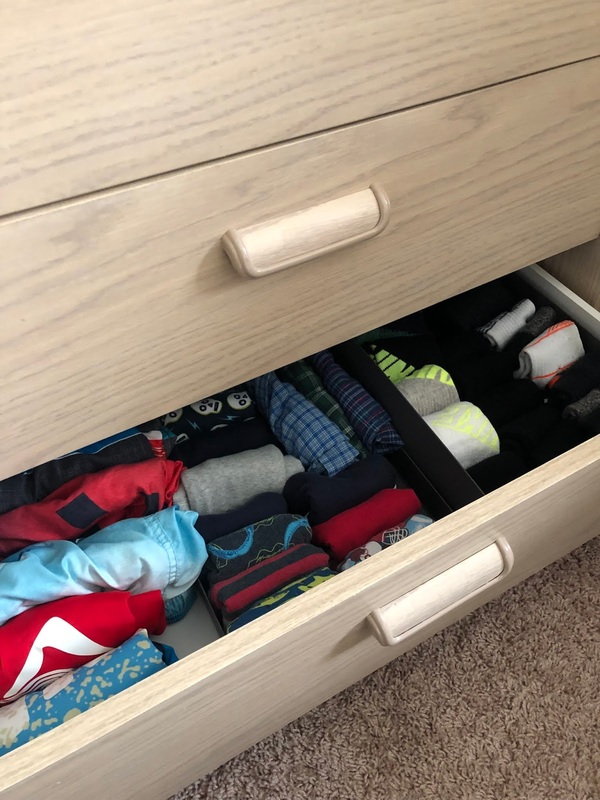 You can find a very helpful video on Marie Kondo: Basic Folding Method, here. Alright, let's just rip this next one off like a band-aid. Don't you judge me, I'm judging myself enough for the both of us! Seriously though, I live in the Midwest and need to keep four seasons of clothing. I keep my items in two closets and rotate with the seasons. The below pile is everything! Everything from both closets, my dresser, my swimwear, workout clothing, literally everything. Plus, remember I've been a blogger for over nine years now and receive gifted items monthly. Here's the thing, I have a daughter and always thought it would be so cool to pass some of the high-end pieces down to her. What I hadn't realized is that I don't have to save it all for her. She may only want a few of them and they would probably be more special if I only saved a bin or so. Alright, it's finally time to go though and get rid of all items that are no longer bringing me joy. Tops: By sleeve length and category. Meaning, silk blouse, button downs, poplins all get hung together. Consider the sleeve length. Start with strapless or spaghetti strap to long sleeve. Same goes for light-weight knits. Heavy sweaters get folded. Organize them by their weight. Dresses: By sleeve length and season. Bottoms: By style and then lightest to darkest. And if you can hang them all, hang them all! For example, start hanging your denim with the crotch fold facing into the closet and with the leg style facing your point of view. Then go to straight leg, boot cut and finally flares. Same applies for your dressy slacks. Use all the same hangers if you can. Its gives your closet a very unified look. I love the felt ones. Cedar really does work. If you want the moths to stay away from your wool and cashmere, use it. If you have anything in plastic bags from the cleaners remove it. The chemicals from the cleaners will ruin the fabric. So, I headed into my closet to do just that! 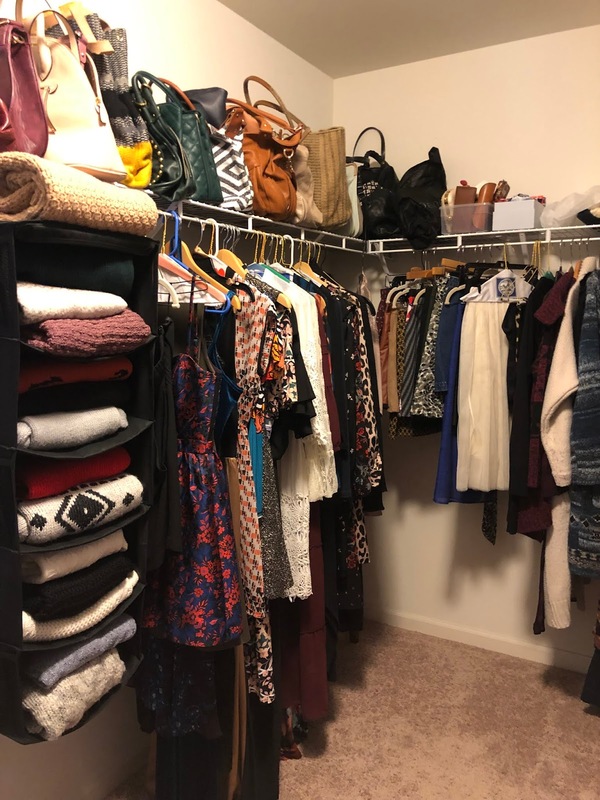 *Update: I've had my closet like this for 29 days and I have to tell you it is amazing! 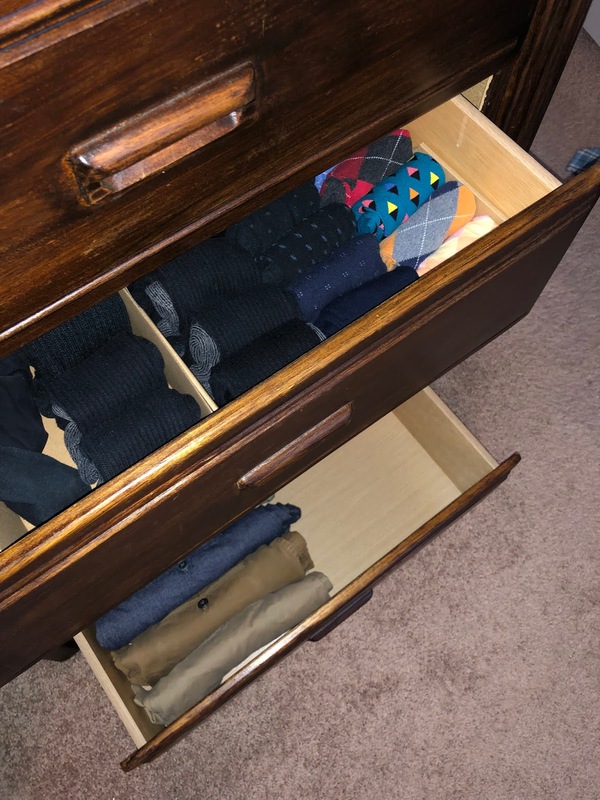 In the past my closet was color coded, but not organized by sleeve length or ankle type of pants. 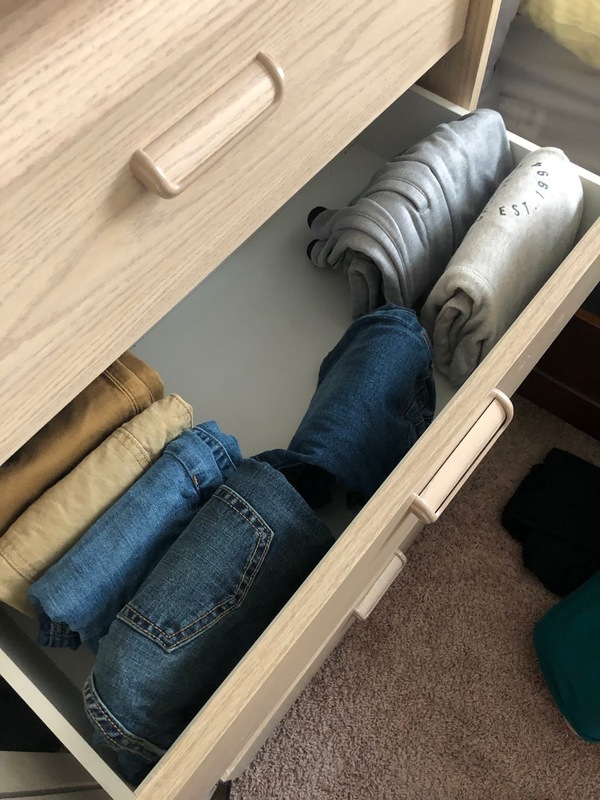 I mean, my pants/denim were never hung at all, so it's wonderful having it this way and it feels like a time saver in the mornings. 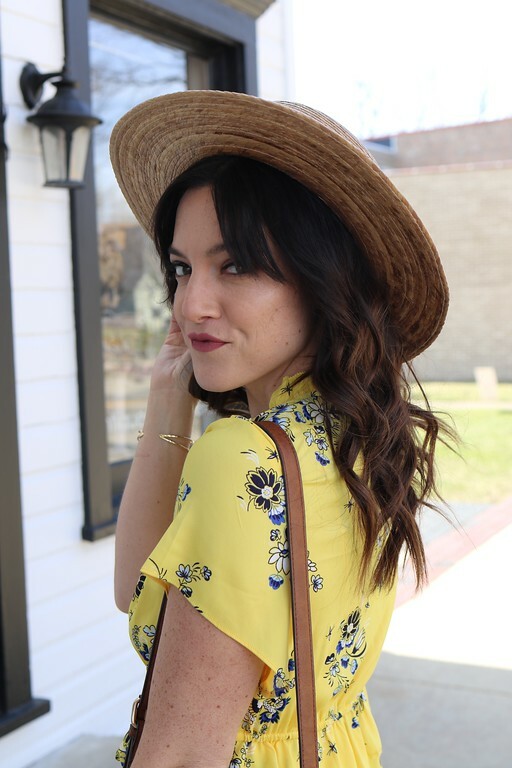 It is so wonderful and makes getting dressed way easier. Thank you again Sanem! 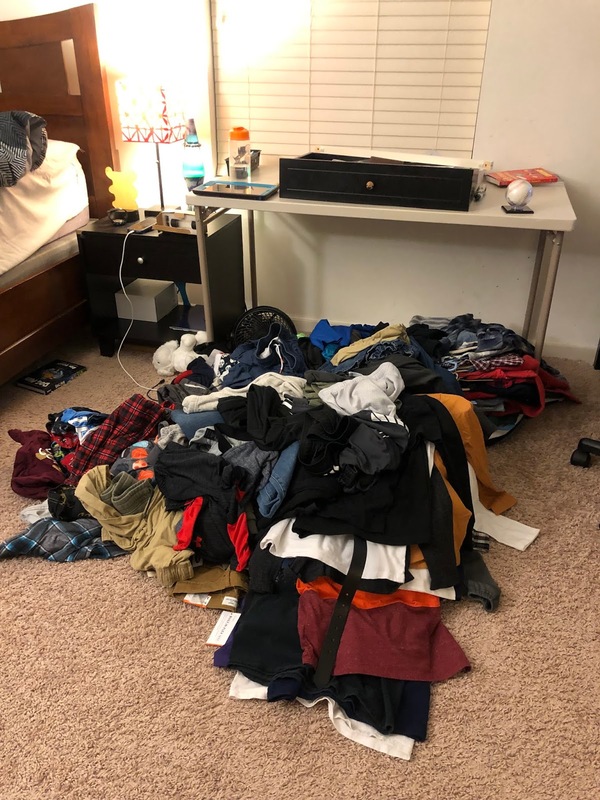 The final pile was my husband's clothing. Although he is not doing the Konmarie Method with me, he has been happy to help when I am on a step and need him to go though his stuff so I can move to the next step. He has also been an absolute champ with bringing the bags to Goodwill! 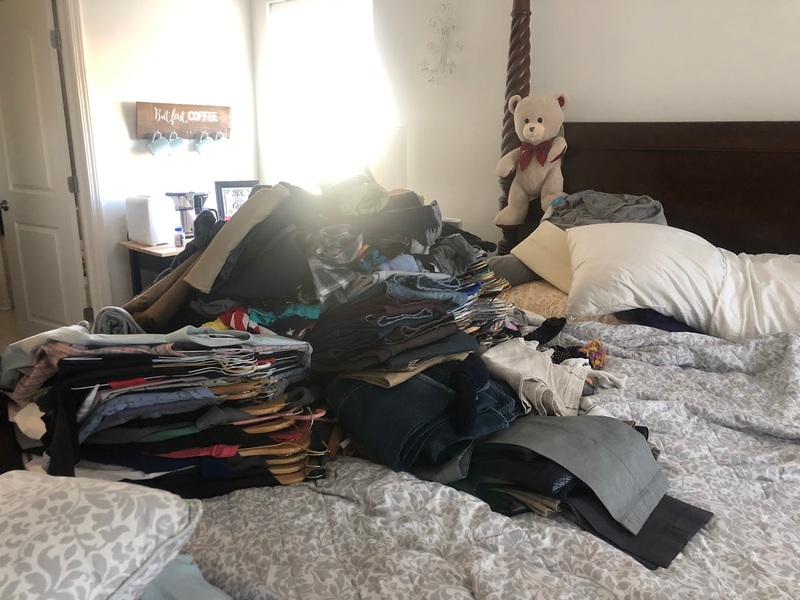 Below is Ryan's pile, he honestly does not have that much, and he was still able to give away two bags. This stage was no joke friends. I started my son's room on January 1st in the evening and finished it by the next morning. 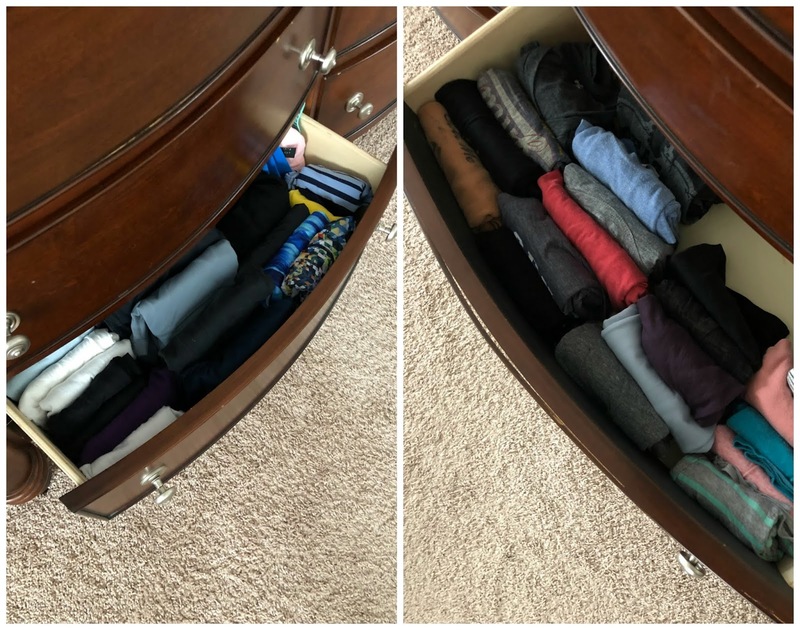 I started and finished my daughters on the second day, and also started my closets on that day. I didn't finish my clothing until the fifth of January! My husband also started and finished his the same day. Five days in and I am exhausted! 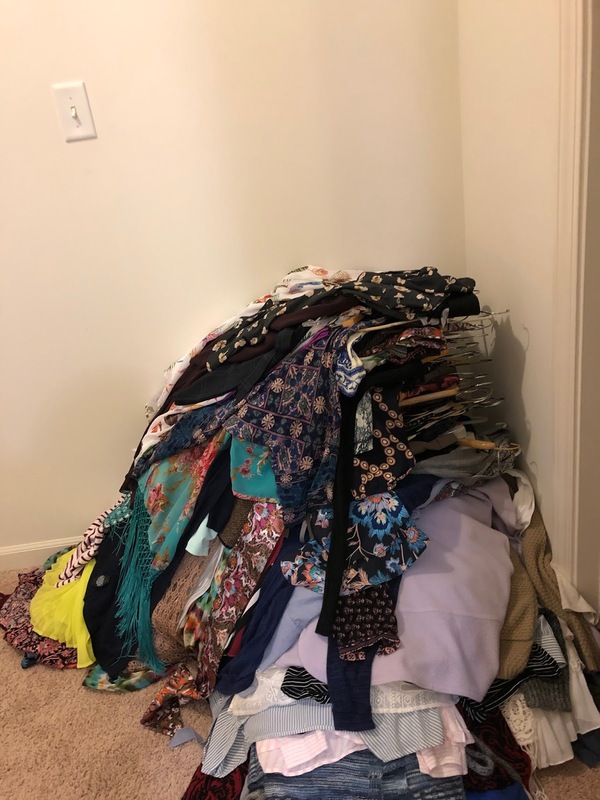 That said, we took thirteen garbage bags full of clothing to Goodwill and wow did it feel great to get it out of our home and get the closets and dressers clutter free! So, our bedrooms are all still a mess! ;) The clothing in every room is so neat and organized, I open my dresser and my heart sings. That said, I can tell I am still a very long way from my stopping point. I would love to finish the rooms now, but the next two stages are books and papers so it will be a few days until I get back to them. Plus my body will absolutely need a day off soon! This work is very labor intensive, especially at the speed I am moving at, but I think I can get it done in less then 60 days at this rate. That's the goal. Mostly because I started this project to feel less cluttered and now the house is in full clutter mode as I take everything out. 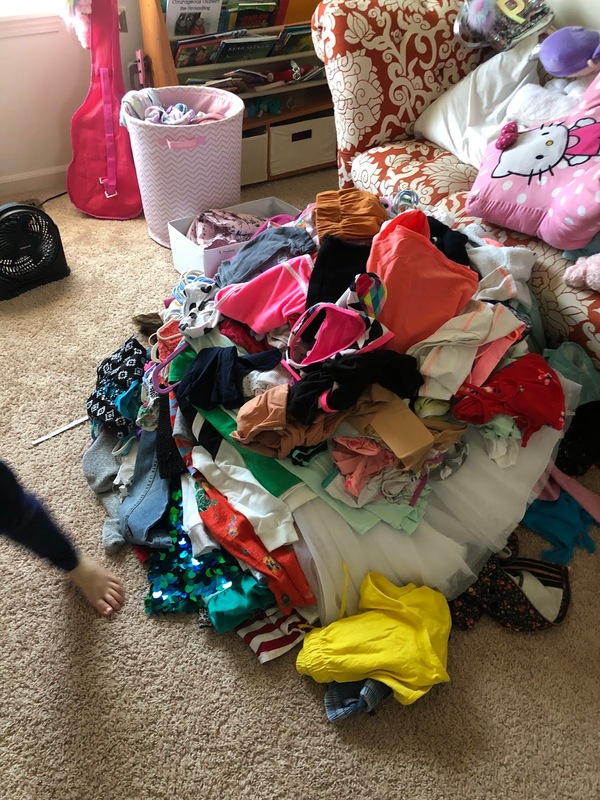 What I wasn't expecting was how much my kids loved learning how to fold and how happy they are now when I ask them to pick out clothing for the day. I truly feel like this method has given them a new life skill and they have been taking more pride in how their rooms look. Very proud parent moment! Is anyone else doing the Konmarie Method on their entire home? Oh yeah folks, I'm also doing my basement! However, I will be waiting until the spring to do our garage....but I digress. Wow, you can be absolutely proud of you! Well done!